That 8-foot thigh bone (which Pol can be seen lying beside above) was the first piece in the puzzle of what’s now believed to be one of the largest dinosaurs ever uncovered. The specimen is a member of a group of gargantuan sauropods from the Cretaceous period known as Titanosaurs, and its discovery was so recent that it doesn’t have an official scientific name yet. The prehistoric behemoth stretched 122 feet long, with 39 feet devoted to its expansive neck alone. It’s estimated to have weighed 70 tons, which is equivalent to 10 African elephants (currently the heaviest land animals alive). 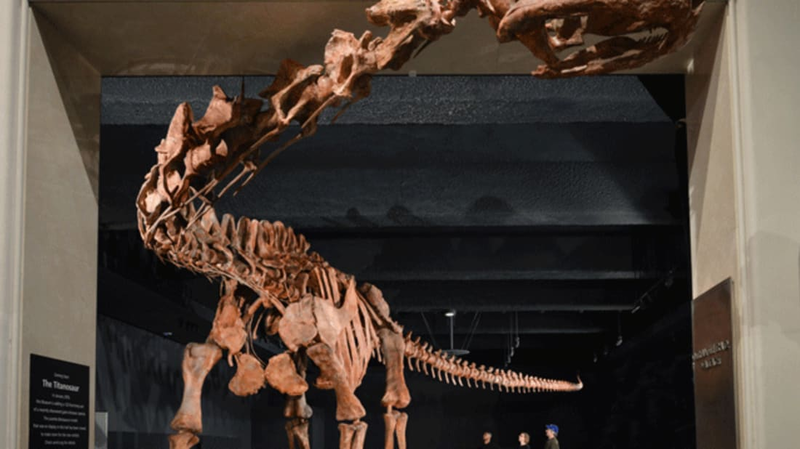 Similarly massive dinosaurs have been discovered in the past, but they have rarely provided as clear a picture as this newly uncovered Titanosaur. Argentinosaurus was thought to be the largest creature to walk the Earth when it was found in 1987, and that estimation was based on just a leg bone, half a dozen vertebrae, and few scraps of hipbone. Over the course of 18 months, this new Titanosaur excavation turned up 223 fossilized bones from six individual specimens. That accounts for about 70 percent of the creature’s skeleton. Using 84 of the excavated fossils, a cast of the full skeleton was 3D-printed in lightweight fiberglass. The model is currently on display at the American Museum of Natural History alongside the actual fossil of the sofa-sized femur that was initially discovered. The Titanosaur is larger than any other exhibit in the museum, and a full 30 feet longer than the iconic blue whale. In order to fit all 122 feet of the dinosaur inside the museum’s Miriam and Ira D. Wallach Orientation Center on the fourth floor, its head has been positioned to poke out of the threshold and greet visitors as they enter. You can watch a time-lapse of its assembly in the video below. What makes the specimen’s size even more impressive is that it’s believed to have been just an adolescent when it died. Paleontologists drew that conclusion by studying the animal’s vertebrae, but they plan to conduct more extensive tests on the fossils in the future. “We can tell by looking at cross-sections of these bones using microscopy how old an animal is, sometimes even how many lunar months an animal has been alive, and in the best case how many days the animal has been alive,” says Mark Norell, Macaulay Curator in the Division of Paleontology and the division’s chair. Even with the bones on display since last week, the specimen is still being exhibited under the broader label of Titanosaur. The dinosaur’s real name will be revealed in the paleontology team’s official scientific paper, which Pol hinted will be coming out soon. All photos courtesy of the American Museum of Natural History.